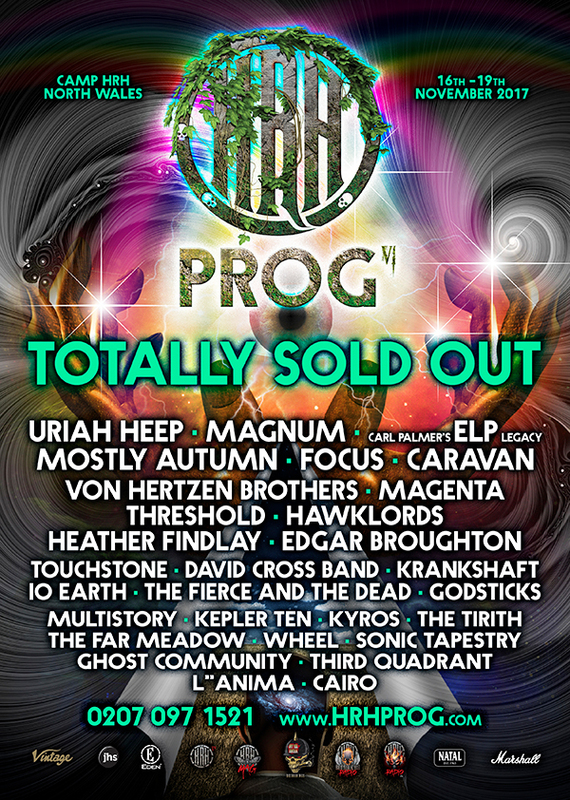 Uriah Heep, Carl Palmer’s ELP legacy, Caravan, and Magnum amongst the great Prog acts for the second HRH Prog of the year. Oh Blessed are ye! Not one – but TWO splendid HRH Prog weekends in one calendar year! Following on from the marvellous HRH Prog V event back in March 2017, the good folks at HRH are hitting town again 16th November 2017 for another dose of classic Prog music at their fine & dandy HQ at the Haven Hafan y Mor Holiday Park in North Wales. Our Festivals For All reviewers simply love the event, and for just a flavour of what the weekend has in store – take a look at our HRH Prog V 2017 Review. HRH Prog VI follows the same format as the March 2017 HRH Prog V bash; the festival now takes over the whole site with more auditoria, bands, and dedicated good-time malarkey. HRH Prog is arguably one of the biggest dedicated Prog weekends on the planet right now. Once again the line-up features some giants of the Prog scene including Uriah Heep, Carl Palmer’s ELP legacy, Caravan, Mostly Autumn, Focus, Magnum, Edgar Broughton, Hawklords, Von Hertzen Brothers, Magenta, and Heather Findlay. There are around 27 acts over the three night event across two main stages, plus the odd unplugged session around the site. Expect the usual VIP sessions and after-show parties plus plenty more to keep you rocking over the weekend. Haven Hafan y Mor Holiday Park has a choice of high-quality chalets, apartments and mobile homes available onsite featuring self-catering facilities. There’s also plenty of options for places to eat and supermarkets exclusively for HRH customers’ use, all within walking distance of the live arenas. The resorts bars and entertainment provide all the creature comforts and, in the round, it’s a great location for a dedicated weekend of Prog related shenanigans! Don’t forget that Wales is absolutely stunning and the park nestles on the edge of Snowdonia in a beautiful location near the North Wales coast. Needless to say – the event has completely Sold Out! Festivals For All are lucky enough to be covering the weekend. On past form it promises to be a very entertaining few days.